Wader Quest: Wader Conservation World Watch - 2nd update. 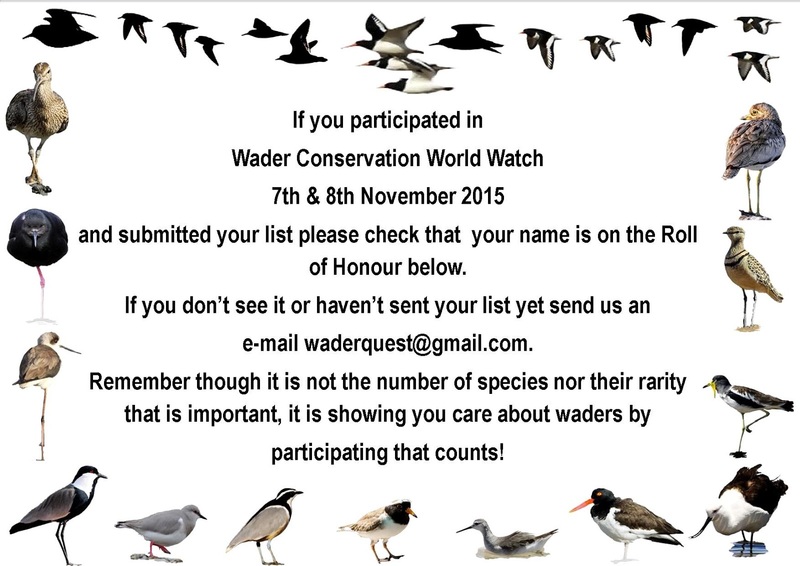 Wader Conservation World Watch - 2nd update. We are approaching the end of the submissions, with some still possibly to come in. We have been overwhelmed by the participation this year, which you can see exceeded the species list unlike last year. As for the species, well we have beaten last year's total and that is with some glaring omissions. We have not (yet?) had any lists from Thailand or India so there are some common species there potentially still to be added. Rob Bush - WA, Australia. Rose Clear - NSW, Australia. Sav Saville - North Island, New Zealand. Steve Merrett - NSW, Australia. Stuart Ford - WA, Australia. Sue Tolley - NSW, Ausralia. Ted Howard - Canterbury, New Zealand. Tony Habraken - Auckland, New Zealand. Wendy Clear - NSW, Australia. Zorica Komac - QLD, Australia. Alicia Mottur - West Vlaanderen, Belgium. Anna Carter - Skåne, Sweden. Astrid Kant - Zeeland, Netherlands. Chris Lamsdell - Strostrom, Denmark. Denise Lamsdell - Storstrom, Denmark. Esfandiar Vahida - West Vlaanderen, Belgium. Eva Hjärne - Skåne, Sweden. P. G. Bentz - Skåne, Sweden. Paul Manning - Lesvos, Greece. Ronald Messemaker - Zeeland, Netherlands. Shahrzade Vahida - West Vlaanderen, Belgium. Steve Dudley - Lesvos, Greece. Allan Archer - Norfolk, England. Andy Hood - North Yorkshire, England. Carey Lodge - Hampshire, England. Chris Craig - Somerset, England. Dan Rouse - Carmarthenshire, Wales. Dan Trotman (RSPB Burton Mere Wetlands) - Cheshire, England. Dave Easter (Devon Birds) - Devon, England. Doug Herdson (Devon Birds) - Devon, England. John Lloyd (Devon Birds) - Devon, England. Gail Pickett - Merseyside, England. Gary Turnbull - Islay, Scotland. Glenn Morris - Flintshire, Wales. Graham Powell - Bridgend, Wales. Gravesend RSPB - Norfolk, England. Helena Craig - Somerset, England. Howard Stockdale - Lancashire, England. Ian Dearing - Norfolk, England. Jack Delbye - Kent, England. Janet Avery - East Coast, Scotland. Jenny McLelland - Norfolk, England. Jill Black - East Sussex, England. Joe Beale - London , England. Jon Mercer - Gloucestershire, England. Julia Lashly - Essex, England. Liz Harris (Devon Birds) - Devon, England. Martin Goodey - Isles of Scilly, England. Matt Merritt - Warwickshire, England. Matt Thomas - Wirral, England. Mya-Rose Craig (Birdgirl) - Somerset, England. Phil Pickett - Merseyside, England. Rick Simpson - Norfolk / Lincolnshire-Kent, England. Rob Norris - Buckinghamshire, England. RSPB North Bucks Local Group - Warwickshire, England. Sue Healey and Gravesend RSPB - Norfolk, England. * Participants at Haribon Foundation in addition to the above.